The American Bookseller Association revealed on Wednesday that 87 new bookstores had opened for business and joined the ABA in 2016. Spread across 32 states and the District of Columbia, the new stores include a romance bookstore, a children’s bookstore, and 21 branches or satellites of existing booksellers. Many of the new bookstores have attached coffee shops, and some like Volumes Books are more cafe than bookstore. And then there's the one which is more of a social space than a bookstore. 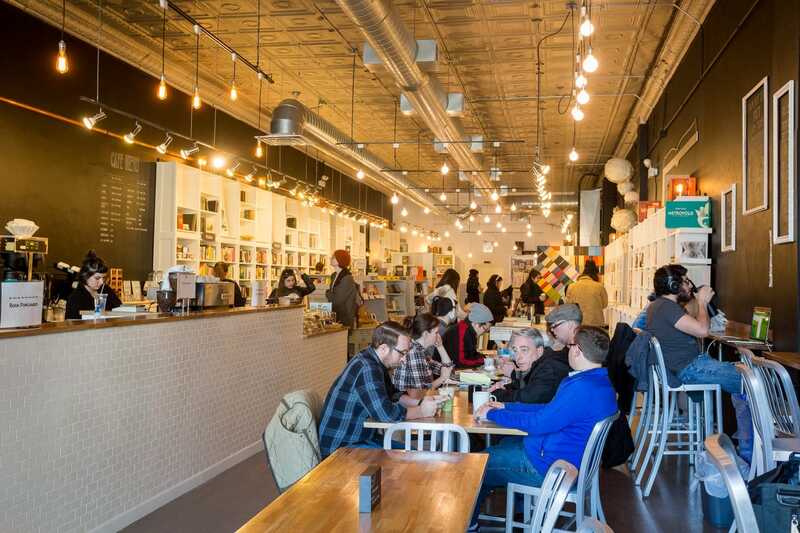 Located in Chicago, Kibbitznest Books, Brews & Blarney describes itself as "a third place". It features a curated selection of books, and its website boldly declares that the store is a wifi-free and laptop-free zone. Given that Kibbitznest encourages you to read their books, use their typewriters, or simply hang out, all for free, the technology restrictions feels vaguely hipsterish. FWIW, Kibbitznest is a non-profit, and you are allowed to read their (usually donated) USED books – which are in the “non-profit” space — while you are there. By inference you can’t just wander away with the new books, which are sold alongside bookish “items” in another “space”. The hipster food is priced at hipster levels. They opened in October. Time will well.